River Rat to keep craft beer ball rolling in Columbia | Drink. Blog. Repeat. With the recent opening of Conquest Brewing Co., Columbia was finally put on the map as a burgeoning beer city in the Palmetto State. But more importantly, it showed prospective brewers that there was support for local craft beer in the Capital City. By the end of 2013 or the first quarter of 2014 at the latest, the second production craft brewery in Columbia will be online in the form of the River Rat Brewery. A partnership between a burgeoning homebrewer with an interest in going big and a longtime professional brewer from one of the country’s largest craft breweries, River Rat is aiming to quench not just the local thirst for craft beer, but also a much larger clientele. About a year ago, Mike Tourville, 51, picked up his first homebrewing kit at Lexington’s Keg Cowboy, eventually expanding into a professional prefabricated 15-gallon system. As he began cranking out double IPAs, non-traditional sours and more, his desire to produce on a much larger scale grew. 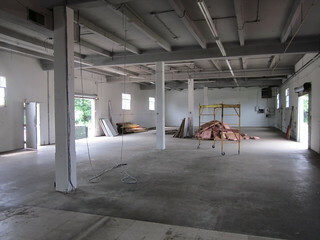 River Rat Brewery will be located in the former Food Resources and Solutions building at 1231 Shop Road in Columbia. So, Tourville set out to get that bigger production going. 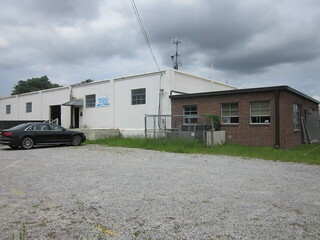 As a with around 30 years experience at Orangeburg-based Zeus Inc., which specializes in material science and high performance polymers, Tourville was able to self-finance the purchase of a building – 1231 Shop Road, in the former Food Resources and Solutions building next to The State newspaper – renovations and construction, and the necessary equipment to get a production brewery online. When all is said and done, the 4,000 square-foot facility will house a 15 BBL brewing system, 30 BBL fermenters for regular releases and 15 BBL fermenters for more experimental beers. The brewery will be able to produce about 45 BBL – more than 1,400 gallons – in one brew day. 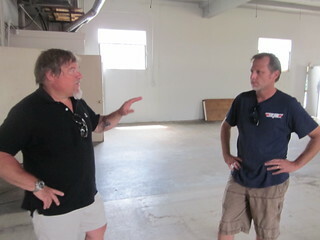 Mike Tourville, founder of River Rat Brewery, talks with Head Brewery Mark Walters inside the future brew house. Tourville admitted brewing on such a larger scale requires a skilled hand, which is why he hired former Abita brewmaster Mark Walters to oversee the brewing operations. Walters has 18 years of brewing experience under his belt, including a four-year stint as head brewer for the largest brewery in the Southeast. Since 2009, Walters has worked as the head of R&D at Abita. Going from an annual production of 175,000 BBL at Abita to something such as River Rat is a change of scenery for Walters, but he’s excited about his new venture. “Mike really does make good homebrews, so I’m excited to get those out on a much larger scale,” said Walters. What exactly River Rat will produce is still being figured out, but Tourville said the brewery will specialize in “full-bodied ales” and “no gateway beers.” His DIPA will likely see mass production, as well as Belgian-style beers, seasonal releases, session beers and more. He hopes to have about five beers available at the brewery’s opening. They’ll also explore either bottled or canned offerings – or both – down the line, and Tourville said he’s aiming for distribution as far as the West Coast in the future. River Rat’s future brew house is currently being renovated. The owners are pushing to get the brewery online by the end of 2013 or the first quarter of 2014. The team is also mulling which distributor to sign with, but Tourville said he’s leaning toward Advintage, which also represents South Carolina’s COAST and Westbrook breweries. Above everything Tourville envisions for the brewery in the future, he wants an amicable relationship with breweries both down the road and across the state. You guys need to get into Google+. The beer community there is awesome. Step 2 in turning ColaTown into a decent BeerTown. Pingback: River Rat inks deal with Advintage | Drink. Blog. Repeat. Actions speak louder than words. I’ve heard a few of the brewers at River Rat say not so nice things about Conquest. At a unveiling event one of them said they were the first “Real” brewery in Columbia, whatever that means. First impressions don’t mean everything, but this was a bad one. The beer community should have some unity. Mike also made comments about Stone saying that if he had to drink another Stone beer he would throw up. I want to like them because they are local, but comments like these make it hard.